We know life can get hectic not always leaving you with enough time to prepare a fresh meal or grill up a tasty treat. Luckily mason jar salads combine all of those elements and keep well for approximately 5 days, making them an ideal grab n’ go option! The key is in the layering. Packing the layers tightly ensures minimal air between layers, thus keeping your salad fresh. Layering your salad greens at the top will create a moisture barrier that prevents the other ingredients from becoming soggy. Seal tightly and place the jars in your refrigerator. When you’re ready to eat the salad, simply pour into a bowl and enjoy! 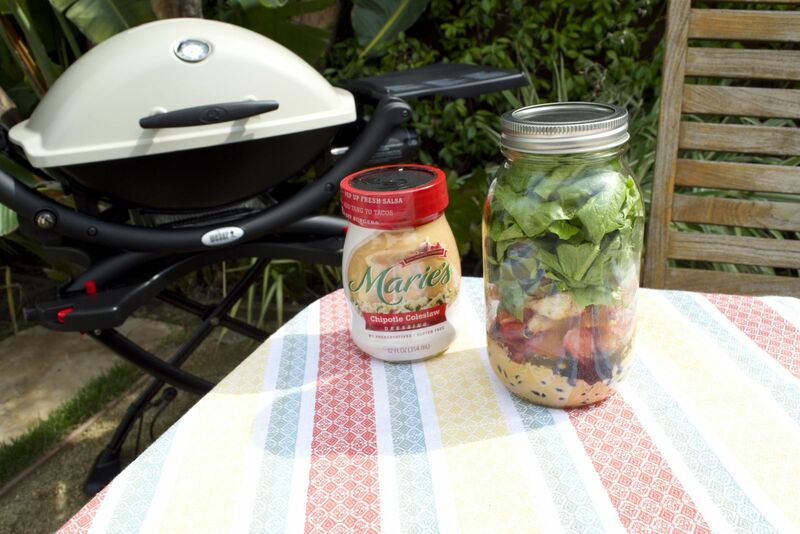 If you are looking for other mason jar salad recipes then check out our post on grilled steak and pepper salad here. 1. Marinate chicken breast with paprika, cayenne pepper, garlic powder and the juice of the lime. Before you put the chicken on the grill make sure you give it a light coating of olive oil which will help with those awesome grill marks and help keep the chicken from sticking to your grates. One tip we suggest is that you make to pound the chicken breast down to make it level, this will help it cook evenly and keep it moist. 2. Fire up your Weber grill and preheat it for 10-15 minutes. You will be grilling on medium to high direct heat, focusing on temperatures around 425-450. 3. Grill chicken breast over direct heat (meaning the food should be grilled directly over the lit burner), for about 4 minutes per side or until the internal temperature reaches 165 degrees. 4. Remove the chicken breast from grill and let it rest for 3-4 minutes, then chop and set aside to cool. 5. 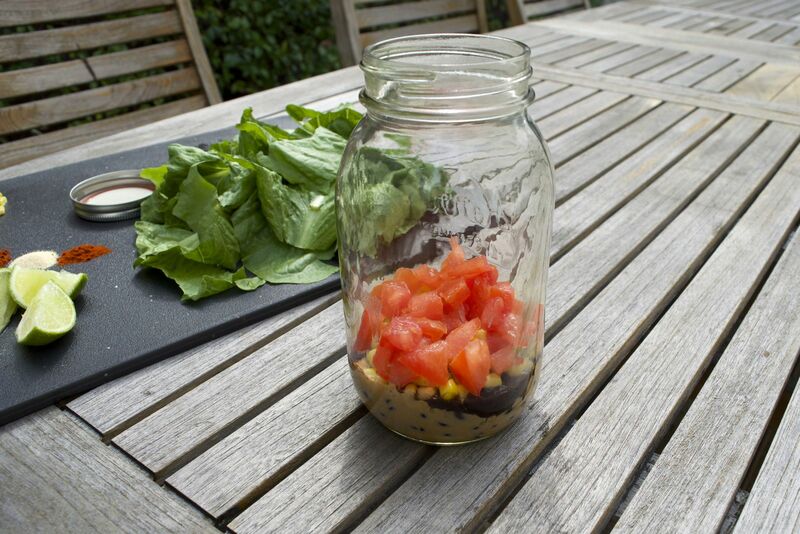 Layer your ingredients in the mason jar in the following order: Marie’s Chipotle Coleslaw, black beans, corn, tomatoes, chicken, lettuce. Seal jar and store in refrigerator for up to 5 days. Shake well before serving.